Is anyone alive in the Midwest? No, that’s not an aerial map of this great land of ours seen through an airplane window. All those bright lights are big, loud cities. Thanks to the National Park Service Division of Natural Sounds and Night Skies (which is real and doesn’t belong anywhere on a business card), we have this fascinating map of where the walking dead may actually live. Note that sea of blue in the Midwest. It’s not a previously undiscovered body of water — it’s proof that residents of the Midwest are either very conservative when it comes to making noise or that they’re too buys playing Walter White to bug their neighbors. Science Magazine reported from the Advancing Science, Serving Society (ASSS) Conference to share what has to be a tough PR hurdle for any convention and visitors bureau in that general area. 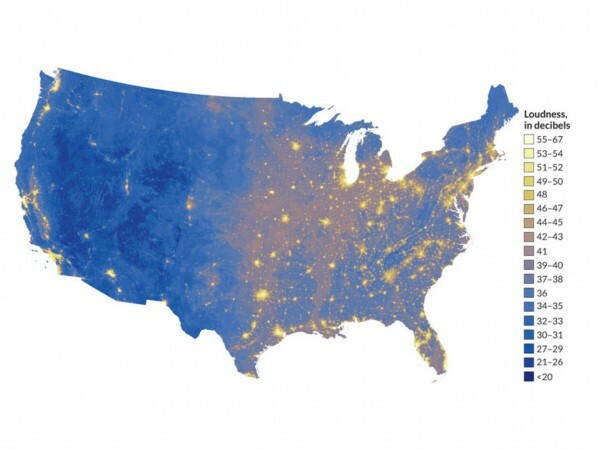 Deep blue regions, such as Yellowstone National Park in Wyoming and the Great Sand Dunes National Park in Colorado, have background noise levels lower than 20 decibels—a silence likely as deep as before European colonization. How would you like to market to prospective staycationers? Since we’ve yet to see a response from tourism directors at the various states affected by this pool of silence, we assume that they’re sticking with the aforementioned silence.